We generally wouldn’t recommend pulling yourself up into the back of a broken-down truck with no license plates that’s sitting in an empty lot down by the river, but Osman’s truck offers a rare glimpse of Istanbul if there really were no rules, and, not to mention, great views of the Golden Horn. In the back of Osman’s truck, with the winter sun reflecting off of the Golden Horn just 20 feet from the hitch, the subject of discussion on a recent afternoon was freedom. “Commerce has ruined the free spaces, the nature within this city,” said Osman from behind the counter, located in the back of the covered truck’s cargo area, now converted into a cozy café, with low tables and padded benches. “There’s no pleasure in it!” added Mehmet, whose role here seemed to fall between maitre d’ and mascot. 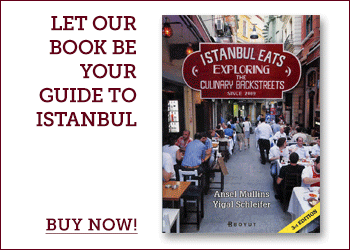 A young man speaking beyond his years, he must have grown up hearing stories of bygone Istanbul when there were woods, shorelines and historic ruins teeming with free spirits and enterprise of all sorts. He stood at the truck’s gate wearing a bright yellow sweater and loudly ordered us a tea from Osman when we stepped into the truck. He swigged at a fat brown bottle of Efes and spoke of this place as his own, though. “At least we are free down here,” he said. 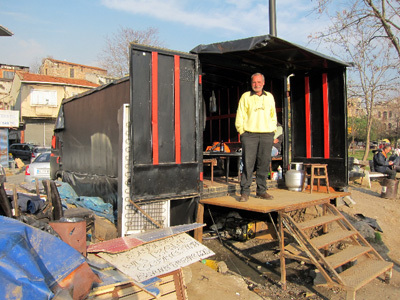 Shanty businesses, like Osman’s, used to crowd the shorelines of Istanbul. Many of the celebrated fish restaurants from Arnavutköy up to Tarabya started as floating pirate restaurants grilling up the day’s catch rent-free. Then the municipality banned such activity, and these fishermen reluctantly joined society, shifting to land-based businesses. But down in Karaköy, on that lonely stretch west of the Galata Bridge, the spirit of freedom lives on unhindered in Osman’s truck. “It’s not easy to come down here and tangle with a man’s business,” said Osman, explaining how his business operates. His roots in that very spot go back three generations. His grandfather and father spent their working lives piloting the rough and lovely water taxis that run between here and Eminönü. Quite naturally, the small dock and its environs came to feel like an extension of the family’s living room. But to us, Osman’s truck feels just like the little bar in the finished basement of a beloved uncle – a fully stocked clubhouse. Most of the time Osman slings çay to the boat captains and beers to Mehmet and his ilk. On one recent afternoon a teenager sat quietly on one of the upholstered benches at the mouth of the truck taking a break from his job at a paint shop around the corner. No çay, no beer. He didn’t pick up the deck of cards on the table, nor did he chat. He just sat there and soaked in the afternoon sun for 20 minutes and left without a word. Freedom! In the summertime, after some renovations are complete on the interior, Osman says anything is possible. 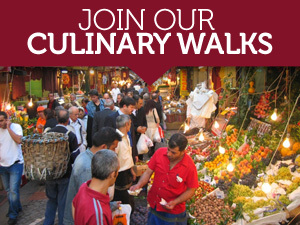 He’ll exercise his right to grill fish and serve rakı to anyone interested. He’s open to the idea of special events and thinks that there might be film crews coming to film something. He pooh-poohed the thought of the rumored Galataport project or other development endeavors that threaten to privatize this area, but didn’t doubt what some people will do for money. “In Istanbul, anything’s possible,” he said. How true, we thought. In Istanbul, even a cup of tea in the back of a rogue tea truck with a priceless view is still possible. Love it, thanks. There’s no stopping çay, is there? Didn’t have much luck finding this truck. Walked across Galata Bridge from Sultanahmet then veered left onto the shoreline of The Golden Horn, walked north on the eastern shoreline til I hit the barrier that ends pedestrian traffic [pretty fierce dog behind the fence too]. Had a great seafood lunch from an itinerant grill man who’d set up a temporary encampment near a shop selling giant maritime stavings though. Any landmarks near this truck that could help me vector in? Also, any good lokanta down in this zone? 1000s of stevedores around these parts, reckon they need to eat at some point. RL- It is possible that Osman’s truck has moved on. He said that it is still road-worthy. We’ll keep an eye out and let you know. There is a good little esnaf lokanta down in these parts called Mutfak Dili. Check our review for the address. Enjoy. We checked up on Osman and the boys yesterday and the truck is still there and open for business. Osman is opening a little late these days, around 2:30PM, but as the weather changes he’ll be opening up earlier, according to Mehmet bey. I’ll be in Istanbul this week and Osman’s sounds amazing – is there a specific intersection that it’s on? If you walk along the Karakoy side of the Golden Horn from the Galata Bridge you will eventually stumble upon Osman’s truck. Go late in the afternoon when he’ll surely be open. 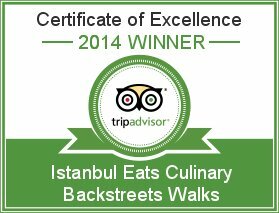 Jan 3, 2014 : Finding travel bliss: Istanbul, Turkey • Where Is Your Toothbrush?